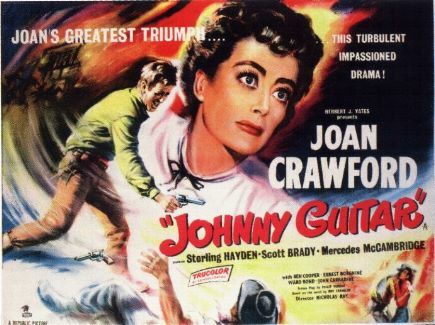 I went to the Lightbox theatre on the weekend, and saw the classic western Johnny Guitar. I had never seen it, or heard about it before, and honestly I’m not much of a fan of westerns, but this wasn’t your normal cowboy film. For one thing, the protagonist is not the titular character, but instead Joan Crawford as Vienna. The antagonist is Mercedes McCambridge as Emma. Vienna has built a saloon in the middle of nowhere, with the advance knowledge that the railroad will soon be coming right by there. She’s prostituted herself to get business information and favours to help her build her saloon. However in the near town is owned by Emma, and her Xenophobic attitudes and fear of losing her town from a population boom leads her to paint Vienna as a villain. The film is about two women who successfully control all the men around them. Not the norm1 for 1954.